My business is based on an assumption that it is possible for any organization to become more innovative – irrespective of its size, sector, culture and leadership. Hence, when I read a senior leader say, “Either you have an innovation culture or you don’t” – I realize it is time to introspect my business assumption. Could my assumption be wrong? Moreover, when the remark comes from Justin Rattner, CTO of Intel, you know you can’t take it very lightly. Is innovation really a DNA which either you have it or you don’t? Let’s explore this question in this article. To understand the context better, let’s see what question Justin was asked in an interview last Tuesday and what he said. Economic Times asked Justin, “How seriously does Intel take innovation?” Justin said, “Intel spent $5.7 billion on R&D in the downturn year 2009 – approximately the same amount as the year before. However, R&D investment is not sufficient for a successful innovation practice. That latter depends upon developing a set of cultural norms that welcome and reward innovation. In other words, the company must display an intellectual curiosity that challenges its employees to find a better way to do each and every function of the company. Innovation can’t be selectively applied. It is either part of your corporate culture, like it is at Intel, or it’s not”. I like what Justin is saying about the importance of innovation being a cross-functional process. You can’t say that we have a great research department, we spend a lot of money on R&D and hence we are bound to be very innovative. Perhaps you have a weak marketing or perhaps your R&D and marketing don’t talk to each other. However, it is the claim in the last line that makes me jittery. Here Justin says, “Innovation is either part of your corporate culture or it isn’t”. 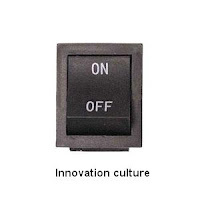 Is innovation culture really a “binary thing” – on or off? Andy Grove was asked in an interview in 2007 to explain what “Creosote Conundrum” meant for Intel. Creosote bush is a desert plant found in Arizona. Its characteristic is that it drips poisonous resins around it so that no new plant can survive and all the water comes to the creosote bush. The analogy was applied to Intel to indicate that all the R&D money & management attention flows into microprocessor business and it acts like a creosote bush. Hence no other new business opportunity survives under it. However Andy is not convinced of the analogy and says, “I have a vague nagging doubt whether creosote bush is a good analogy to what was happening there anyway. What if no other plant (other than microprocessor ideas) was coming out? Did Intel have a good enough innovation culture – whatever that means? Too many unproven and unsubstantiated assumptions” Perhaps Justin knows something about Intel that Andy Grove didn’t. It is easier to look at a company that has published how its innovation practices evolved over a century – 3M. It took 3M more than a decade to understand the importance of quality assurance. It took another 20 years before someone assessed the rate of success for its new product introduction and established a one man innovation department. Later it learnt how to develop innovation platforms and technical career paths. Perhaps Justin has discovered a switch that turns your innovation culture from off to on. Until we find more about it, I will stick to a simple innovation dashboard, an ecosystem view and a method of innovation that has evolved from Edison to Lafley over the last 130 years. You have raised an important issue. Innovation ought to be an important cultural dimension for a progressive organisation. This is also important for the society, why should we tolerate age old inefficient practices and waste our hard earned money? I think some amount of incentivisation works, if Government has a strategic focus towards innovation a lot could happen. We have no dearth of talent.